B2B CFO® offers Part-Time CFO® Services. The key focus of our Part-Time CFO® Services is usually related to the "immediate needs" of a privately-held company. Most often, the immediate needs are first centered on the issues related to cash. The focus on cash is critical to the viability of a company. It is a fact that a company can grow itself out of business by if the owner/managers do not understanding complex issues related to the cash flow of the company. There is often an inverse relationship between cash and increased sales as shown on the following graph from Chapter Four of our book, Avoiding The Danger Zone. This graph illustrates the normal environment of a company that is on the Accrual Basis of accounting. 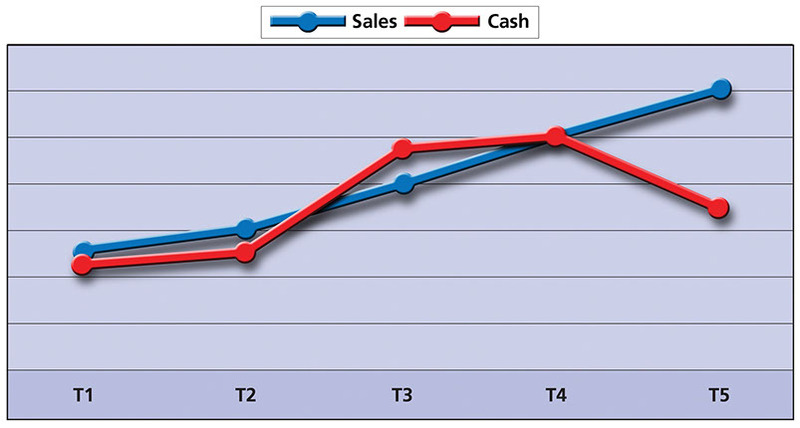 It shows that, at a certain point, cash dramatically decreases as sales increase. The complexity of cash decreasing while sales increase is usually expressed to us by business owners who ask, "Where is our cash? We used to have more cash in the bank when the sales of our company were much lower than they are today." The goal of our Part-Time CFO® Services is to help answer the question of "Where does the cash go?" We are the industry experts at answering this question. Employee theft Are employees stealing cash or other assets of the company? What controls, if any, does the company have to stop the theft? What insurance, if any, does the company have to possibly recover the cost of the theft of assets from employees? What are the industry norms of theft insurance for your company? Trade Receivables Do key customers who are past due on paying your company have business problems that are causing them not to pay on time? What controls, if any, does the company have to verify the credit risk of a customer to whom the company sells products or services on terms? Becoming a Bank Has your company inadvertently become a bank by lending money to customers who do not pay on time? If so, where is the risk your company as related to lending money to customers who pay late? Are the proven methods to speed up the collection of receivable payments? Are there proven methods to allow your company to have more security when selling to customers on terms? Inventory Does the company have inventory that is obsolete? What are the controls, if any, on the purchasing of inventory? What are the controls, if any, around the purchase pricing and terms of buying inventory? Debt payments Do the terms of the notes payable to bankers and lenders cause the company to pay too much in principal payments that drain the company's cash flow? Should notes payable be refinanced at longer terms or lower interest rates to help the company's cash flow? KPI's How close is your company to the KPI's (Key Performance Indicators) of your industry related to cash, working capital, etc.? Other Areas Other areas that often drain a company's cash flow might include, purchases of equipment; income taxes; increased costs of production or services; increased administrative expenses; governmental compliance expenses; increased labor burden, etc.